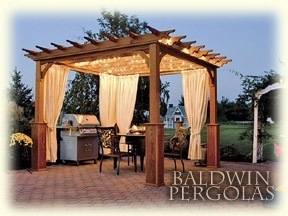 I learned a new word today…Pergola. We are building one, but I didn’t know what to call it! 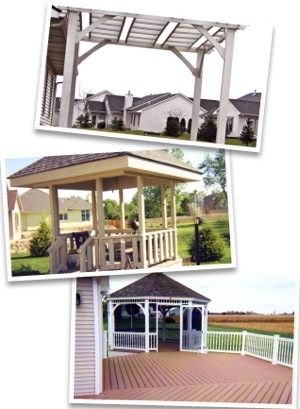 After googling gazebo and porch ideas, I stumbled on some photos of what I had in mind and discovered it had a name!! 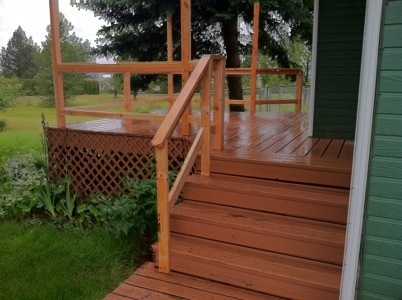 Our insurance company is requiring some porch railings on two of the three porches that are on the new house. Daryl has started on one of the porches. It’s a great start and I think enough, for now, to satisfy the insurance company. We plan to finish it in August when he has more time. So now that I know what I’m looking for, I found some ideas that I love! Love the fabric detail and the slatted top! Here it is at night with little white lights. I stole this photo because the bottom picture shows a brown porch with white railings and a white gazebo. 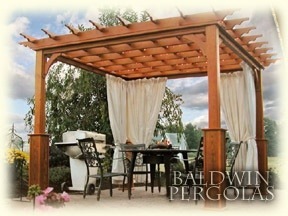 Because the trim on our house is white, I think the Pergola is also going to be white. I can’t wait to have some beautiful fabric, white lights, and a sweet candle light supper!! That setting is fit for ANY guest! 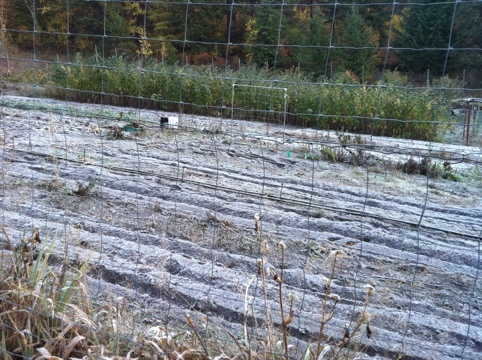 We’re getting a heavy frost each night now. We have a fire in each wood stove now. We dress in layers now. Winter is coming and things are happening around here so we will be prepared. 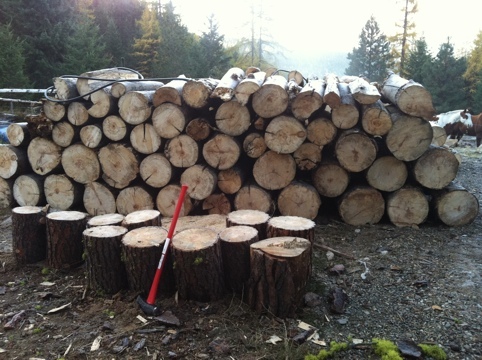 The Woodman has been busy getting wood. I think this is his favorite time of the year. 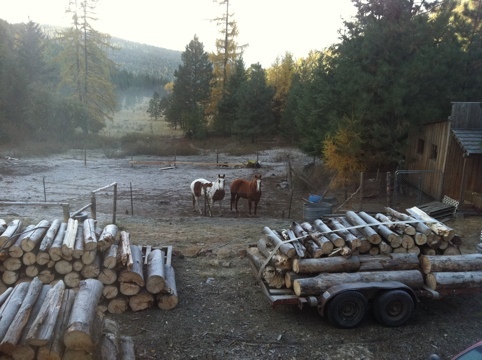 He’s made friends with a neighbor that owns thousands of acres, and has permission to get any downed logs. I think he even got permission to cut a few trees down here and there as well. I don’t think anything would have made him much happier. This is the view out my living room windows. These are fairly massive piles of logs. 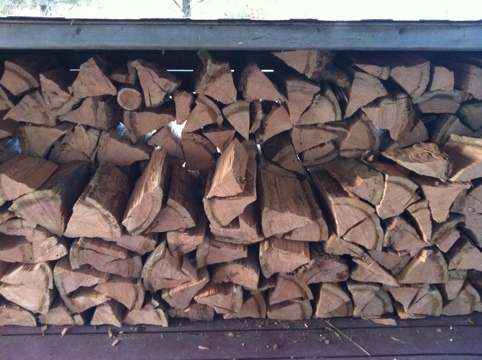 There is still a lot of work to do before this wood can be burned in the wood stoves! The horses are waiting for their breakfast. They make just the perfect couple, Shinanigan and Slick. They are exactly the same color, but Shinanigan is prettier and flashier, and that’s the way it should be. 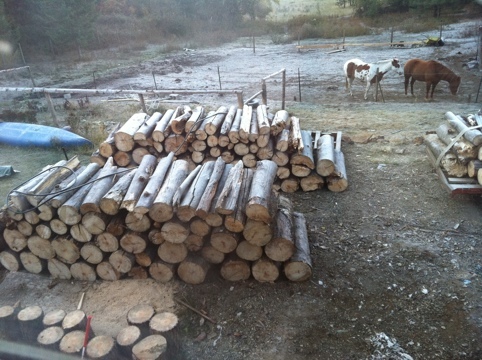 This is the view of the log pile just outside the back door. 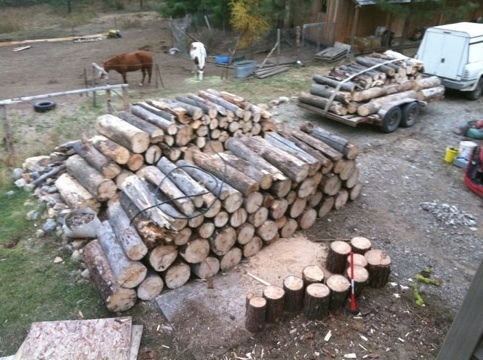 The second pile is directly behind this one, and the third log pile is still on the trailer. This is the view just outside my front door. Wood is a very important resource right now, and for the next 6-7 months. 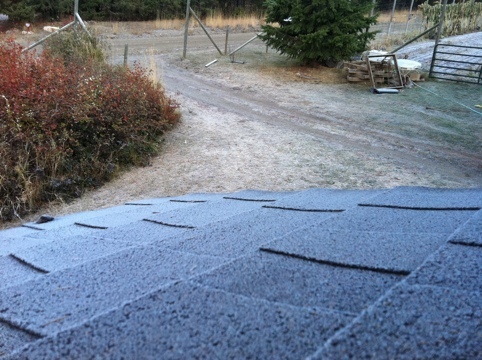 This is the little roof over the wood outside the front door. It’s covered with frost this morning, as is the garden. The fall colors are beautiful right now as well! We took out the square foot garden boxes that were in the garden. If somebody wants 8 beautiful 4 x 4 boxes, just let me know! We are officially putting the garden to “sleep” this year. The Woodman has been hauling horse manure up from the pasture and spreading it all over the garden. I guess he has big plans for next spring. I have some big plans too. 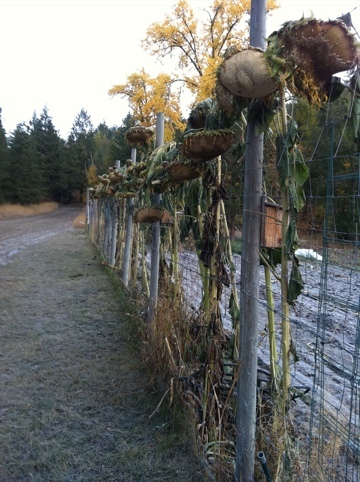 The sunflowers are drying over the garden fence. 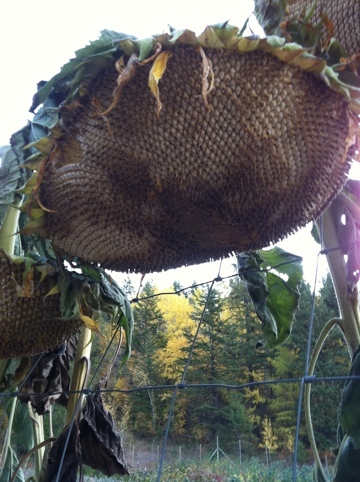 I’m not sure they were mature enough, but perhaps there will be something for the birds to enjoy! The fall colors are peeking out all over the place. I love this time of year! My feet were frozen when I got back into the house this morning. 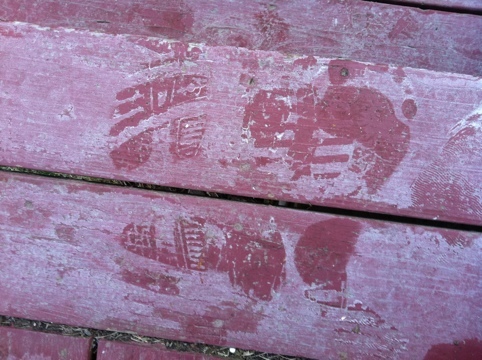 It’s pretty easy to tell which footprint I left on the front porch!